When most people see a fallen tree, they think nothing of it. Unless it happens to fall in your yard, then you might think of the cost to remove the tree. 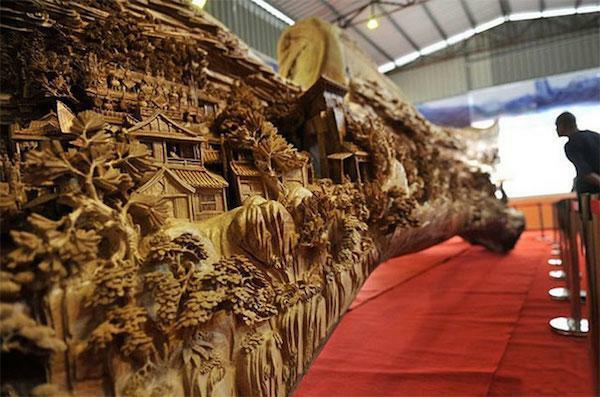 And an opportunist might even see the potential for firewood, but most would not think to carve the entire tree into an intricate work of art. 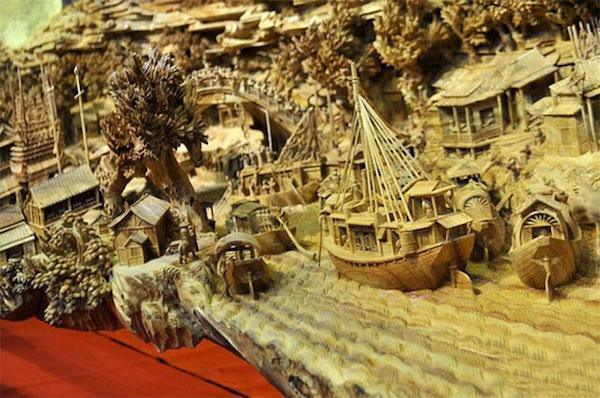 However, most people are not Zheng Chunhui, a Chinese artist, who is a master in wood carving. 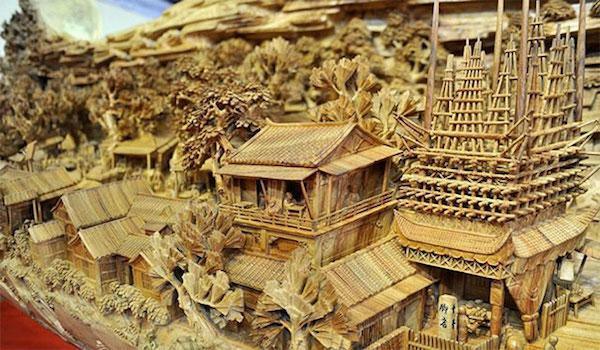 Wood carving has been a long-standing Chinese tradition dating back thousands of years. Artists train their whole lives perfecting their technique in carving intensely intricate figures into wood. 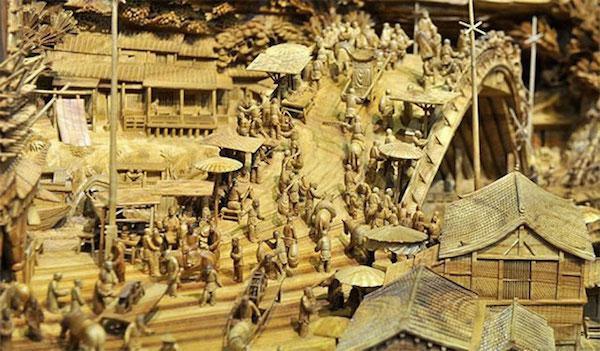 Zheng Chunhui recently unveiled his masterpiece called "Along the River During The Qingming Festival". 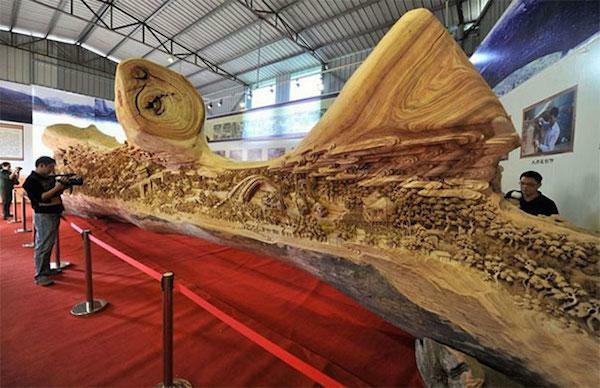 The masterpiece is a 3D carving done inside the trunk of a tree that depicts a painting by the same name that was completed over 1000 years ago by Zhang Zeduan (1085 to 1134 AD). The original art was painted on hand scrolls and depicted the every day events at the Qingming Festival, a ceremony honoring their dead which involved prayers and sweeping of tombs on the 104th day after the Winter Solstice. "Along the River During The Qingming Festival" focused on the activities that were held behind the scenes and showed the lifestyle and dress of regular people (rich and poor alike) from rural areas to the inner city. Here is a picture of the original artwork painted on handscrolls. It is 5.28 meters long, that's more than 17 feet. 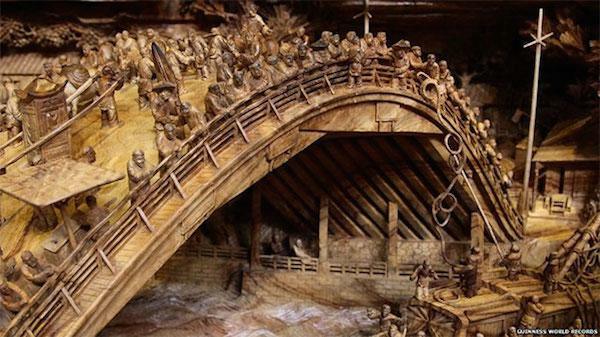 It took Zheng Chunhui 4 years to complete the sculpture with its amazing and intricate detail. He is even in the Guinness Book Of World Records for the longest continuous wood sculpture in the world. The detail is remarkable! Especially compared with the painting. You can even see where a rope is being lowered to a barge to help keep it from running into the bridge. This is the urban section of the sculpture which shows temples and houses. When you see how much detail is going into this sculpture, it's hard to believe it only took 4 years to complete!